This is a great grooming shear set from Kenchii. It's perfect for the beginner and the experienced alike. 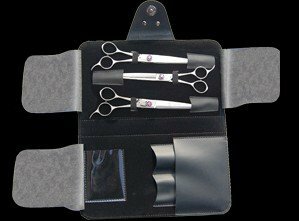 Great steel, durable beveled edges, and the comfortable even handles make this kit a true pleasure to use. The Scorpion set will get the job done over and over again! Kenchii shears are all manufactured with Japanese forged steel, and the quality is well known throughout the grooming industry.